Located on the Costa del Sol “Coast of the Sun” – the southern Mediterranean coast of Spain, Marbella – one of the luxurious resorts in Europe. 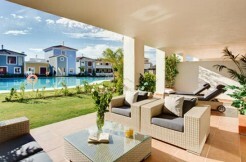 Wealthy aristocrats, businessmen, artists, and many celebrities have chosen Marbella place their residences. Amazing sandy beaches, well-maintained boulevards, bordered by two rows of trees, modern shopping malls, restaurants where all the cuisines of the world and a wide range activities. You will find here numerous golf clubs and prestigious yacht clubs as well as some of the best tennis. In the vicinity of the famous Puerto Banus – urban port of international importance, lie Benahavis, Estepona, Nueva Andalucia and San Pedro with a huge selection of real estate to cater for all types of buyer. Retaining the special atmosphere of culture, customs and traditions of Andalucia, Marbella – a cosmopolitan city, a spirit of openness and hospitality. For those who want to take everything from life, there is no place more attractive than Marbella and Puerto Banus! A Mecca of glamor, luxury and style that has not lost its sparkle over decades. 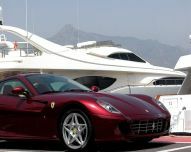 Shopping in Puerto Banus is something completely different than usual, walking among the large and expensive yachts, such as the megayacht Shaf King of Saudi Arabia, seeing high-end card parked, such as Bentley, Ferrari and Aston Martin, you know that you have come to a special place! In the port, you will find the best selection of luxury fashion brands: Louis Vuitton, Armani, Hermes, Loewe, Dior and Versace and many others. Life here is buzzing almost twenty four hours a day. You will enjoy the unique atmosphere of nightclubs that have attracted to the cream of the world’s elite, enjoying Marbella on private yachts, airplanes and luxury cars. Here you can enjoy golf or tennis, take a thrilling race on a private racetrack at Ascari, evaluate impeccable service at its restaurants, relax on the beach clubs in Marbella, such as the Purobeach, Ocean Club and La Sala by the Sea, and just enjoy the beauty of life under the gentle southern sun. If you choose the interpretation best places in the world, Welcome to Marbella – paradise on earth! Marbella – a town and municipality in Spain, in the province of Málaga, in the autonomous community of Andalusia. The municipality is a part of the district (comarca) Costa del Sol Occidental. Covers an area of ​​117 square kilometers. Population – 126 422 people (2007). Distance to the provincial capital – 58 km. Patron saint of the city is Bernabe. Marbella stands out for its privileged climate. The average annual temperature is about +18,5 º C, 320 sunny days a year, rain in our city usually does not exceed 50 days per year. This climate is associated with a unique geographical location of the mountains around Marbella, Sierra Blanca and La Concha, visible from all over the county. The City is in the bay and sheltered from the northern winds, which creates a special micro-climate. 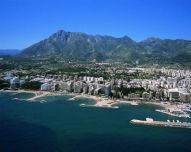 Thanks to its unique climate, Marbella and has remained one of the biggest tourist attractions in Europe. The biggest and most important project in the future of Marbella, the expansion of the Marbella harbour. 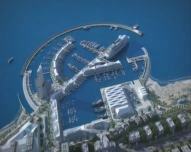 The new port will be completed around 2015 and will be one of the most modern and luxurious in the Mediterranean. Cortijo del Mar Apartments, Costa del Sol.